Adi Meyerson Is an Israeli raised Bassist and Composer. She was born in San Francisco to American Parents. At the age of two, she relocated with her family to Jerusalem, Israel. In August 2012 she moved To New York to continue her studies at "The New School for jazz and contemporary music", where she graduated from in 2014. She received an opportunity to study with some of the great masters of the style such as Reggie Workman, Ron Carter, Charles Tolliver, Kirk Nurock, Billy Harper, Bob Cranshaw and many more. 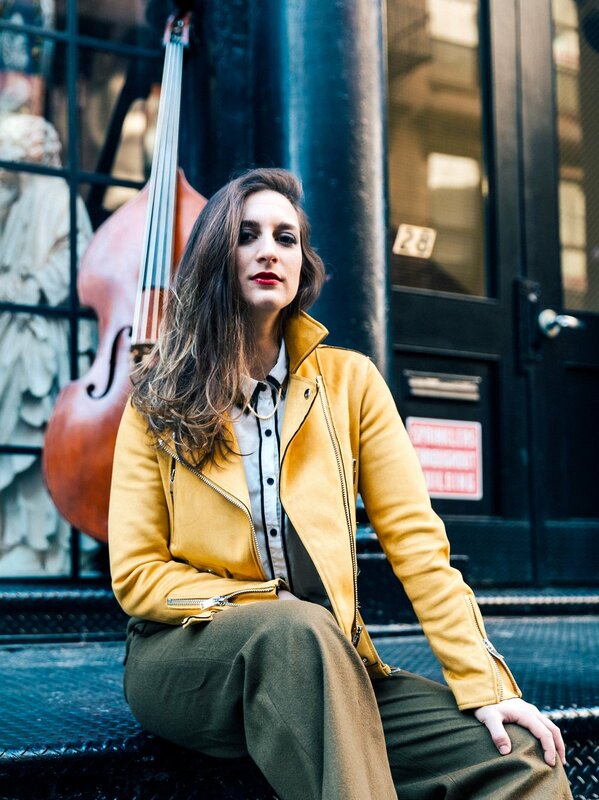 Since Moving to New York, Meyerson has already made an impact on the NYC jazz scene and earned her title as an up and coming young talent. She has played with many local greats such as Joel Frahm, Joe Magnarelli, Steve Nelson, Charli Persip and many others around the NYC area in highly known venues such as Mezzrow, Smalls jazz, Fat Cat, Smoke Jazz, Minton's, Zinc Bar, Dizzy's Coca Cola, and others. She has recently toured the US and recorded with the Champian Fulton band for Positone records. ! Meyerson leads her own band, the ”Adi Meyerson Band”, that has been performing together since 2016. The band has performed in many of New York City's prestigious jazz clubs such as The Jazz Standard, Minton's Playhouse, Smalls Jazz, Mezzrow, The Cell theater, Fat Cat and others. The band headlined the "Make some Noise" music festival in May 2016 and participated in the "Jazz in the Cave" concert series in June 2016. In September 2017, the band recoded their debut record "Where We Stand" which contains 9 original compositions all by Meyerson.on "Where We Stand" Meyerson showcases her talent as both a Bassist and Composer with an All Star Band featuring special guest vocalist and guitarist Camila Meza, tenor saxophonist Joel Frahm, trumpeter Freddie Hendrix, pianist Mike King and drummer Kush Abadey. Meyerson has toured around the US with her band, toured Costa Rica with her Trio in 2017 and 2018, and performed as part of the faculty of the Quezaltinango International Jazz Camp with her trio in December 2017.
to the youth. Adi also teaches at "Jazz House Kids" as part of their yearly "Chica Power" Residensy. In December 2017, She had a chance to travel to Guatemala to teach in the Quezaltinango international Jazz camp along side local and American professors. Meyerson was selected to participate in the prestigious "Stanford Jazz Workshop Mentor Fellow 2018-2019" Program, learning new teaching techniques and eventually joining the SJW faculty and preforming at the Stanford Jazz Festival.